Our story has to begin somewhere and why not with the Manchester schoolteacher John Dalton who revived the atomic theory of the ancient Greek philosophers? In addition to supposing that the ultimate components of all matter were atoms, Dalton set about putting this idea on a quantitative foundation. He published the first list in which he compared the weights of the atoms of all the elements that were known at the time. Dalton did this by assigning a weight of one unit to the lightest element, namely hydrogen. Next he assumed that a compound like water consisted of one atom of hydrogen and one of oxygen. By appealing to data on how much hydrogen combines chemically with how much oxygen, he arrived at the weight of one atom of oxygen relative to the weight of a hydrogen atom and so on for all the other elements. Of course the formula of water is now known as “H2O” rather than “HO” but this was already a good start. Once relative atomic weights had been established in this way, other chemists began looking for possible numerical relationships between the atomic weights of different elements. Two such relationships were soon found. In 1827 Wolfgang Döbereiner discovered triads of elements for which one of a set of three elements had an atomic weight that was approximately the average of the weights of the other two elements. Lithium, sodium, and potassium represent a typical example, in which the atomic weight of lithium (7) added to the atomic weight of potassium (39) divided by two, gives 23 or the approximate weight of sodium atoms. Even more suggestively, the reactivity of sodium is intermediate between those of nonreactive lithium and highly reactive potassium. Here then is a relationship not only connecting together three distinct elements but apparently also capturing something about their relative tendencies to react chemically. Suddenly the diversity displayed by fifty or so distinct elements appears to have some unified aspects, some underlying order. Next the physician William Prout, working in London, also took as his point of departure the published set of atomic weights of all the known elements. He noticed that most of the weights were whole number multiples of the weight of the lightest atom, that of hydrogen. Prout’s conclusion was that perhaps all the atoms, and therefore all the elements which they made up, were literally composites of hydrogen atoms. Here again we see a hint of an underlying order, a unity lying underneath the existence of seemingly very different elements, each with its distinctive properties. Moving forward in time to the 1860s we find the simultaneous discovery of chemical periodicity and the associated periodic table which serves to represent this behavior by at least six individuals all working independently of each other and mostly in different geographical locations. The first of them was a French engineer Emile Alexandre de Chancourtois who arranged the elements along a line in order by increasing atomic weights. He then wrapped this line around a metal cylinder to form a spiral, so that vertical lines connecting different parts of the spiral reflected the fact that the properties of chemical elements seemed to recur approximately. For example, he was able to recover many of Döbereiner’s triads of elements such as lithium, sodium, and potassium as mentioned earlier. 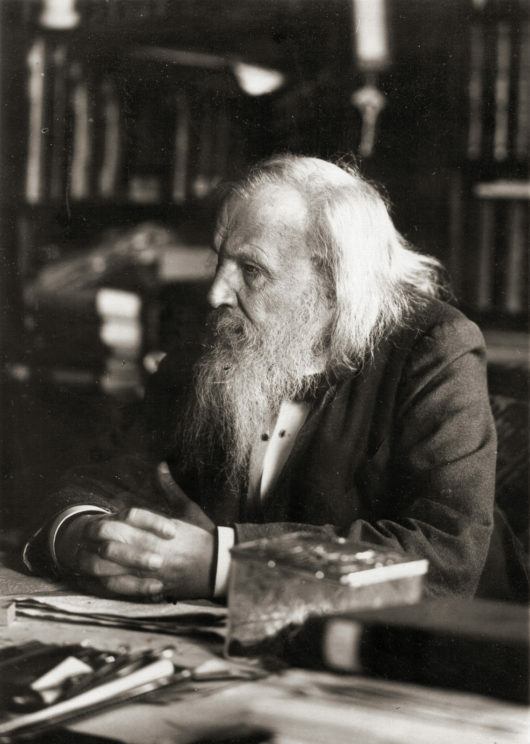 Dimitri Mendeleev is one of the most well-known scientists credited for the discovery of chemical periodicity, though he is not the only to have made this discovery. Image uploaded by Serge Lachinov. Public Domain via Wikimedia Commons. Over a matter of just seven years essentially the same discovery was made again, twice in London by John Newlands and William Odling, in Iowa by the Dane Gustav Hinrichs, by the German Julius Lothar Meyer and, best known of all, by the Russian chemist Dimitri Mendeleev. Most people have only heard of the last of these discoverers for various reasons. Science historians and scientists themselves tend to regard the notion of multiple or simultaneous discovery as something to be explained away and are generally keen to identify just one ‘true discoverer’. In the case of chemical periodicity they have latched onto Mendeleev with some degree of justification. Unlike some of the others mentioned in this context, Mendeleev left gaps in his periodic tables and believed that there were new elements waiting to be discovered. He also went further in predicting the properties of these as yet undiscovered elements, many of which turned out to be remarkably correct. His most notable successes lay with three elements that he provisionally called eka-boron, eka-gallium and eka-silicon. All three of these elements were isolated from minerals within a period of 15 years and were found to have almost exactly the properties that Mendeleev claimed they would have. But none of this success should overshadow the fact that scientific discoveries are almost invariably made by two or more independent researchers working over very similar time periods. Such a view would seem to evoke the notion of an evolutionary growth of scientific discovery, which over-rides the contributions of individual and often rival scientists. It seems to suggest that scientific development has a life of its own and perhaps it challenges the traditional image of exceptionally gifted individuals whose superior rational and practical skills allow them to prevail over other scientists. Finally, I believe the same is true about the historical development of our knowledge of atomic structure that took place at the beginning of the 20th century and, I venture to suggest, all scientific development whatever the instance might be. The traditional historical accounts of how atomic structure unfolded feature such luminaries as Thomson, Rutherford, Röntgen, the Curies, Bohr, Moseley, Pauli, G.N. Lewis, and Langmuir among others. A more egalitarian and unified account would also feature a host of virtually unknown contributors including Nicholson, van den Broek, Abegg, Bury, Main Smith, and Stoner. I challenge any reader of this blog to recall what any of this latter list of scientists contributed to the present understanding of atoms and how electrons are arranged around them. Seen from the global perspective that I am promoting all of these contributors can be seen as equal partners as part of a living and organic scientific mind. Featured image credit: Portion of the Periodic Table depicted with cupcakes by the Chemical Heritage Foundation. CC BY-SA 3.0 via Wikimedia Commons. Eric Scerri is a chemist, writer, and philosopher of science. He is a lecturer at the University of California, Los Angeles. He is the author of A Tale of Seven Elements, The Periodic Table: A Very Short Introduction, and The Periodic Table: Its Story and Its Significance, and co-editor of Essays in the Philosophy of Chemistry. 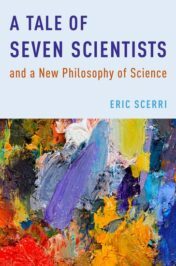 His forthcoming book is titled, A Tale of Seven Scientists and A New Philosophy of Science.